What are the best and most beautiful places in Turkey to visit? Here are 9 unique places that are worth traveling to, no matter what time of the year it is! Turkey is a big country that has lots to offer: from sun-drenched beaches to lush mountains, from vibrant modern cities to historically old towns. You’ll often find yourself in a place that seems so unreal, you’ll wonder if you didn’t end up on another planet. Mother Nature has treated Turkey well! We spent nine months here so we had plenty of time to visit various locations. Some of them were mentioned in tourist guides, others were recommended by locals or we discovered them during one of our hitchhiking trips. They all marked us in a very special way and we would love to share those places with you. How much does it cost to backpack in Turkey? Find it out here! 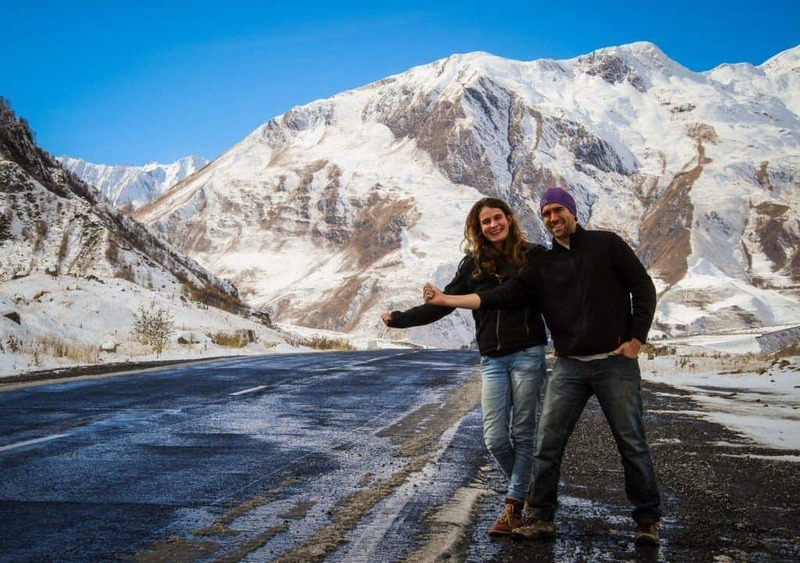 We hitchhiked to each location but you can also get there by bus or dolmuş . The dolmuş (pronounced dol-moosh) is a minibus that is often cheaper than a bus. You can find more information about how and where to catch a minibus on Turkey Travel Planner and wikihow. Gelemis is small village completely off the beaten path and untouched by mass tourism. It’s set right at the edge of the coastline in the foothills of the gorgeous Taurus mountains and it’s the perfect place for expat artists in need of some inspiration. Life here is organized around agriculture and apiculture. People grow all kind of fruits and vegetables and the landscape is filled with small clusters of beehives. If you have a chance to visit Gelemis, make sure you try the various local honey that is produced from different varieties of flowers. Right next to the village lies an 18-kilometer beach, often referred to as one of the most beautiful and unspoiled beaches in all of the Mediterranean and the second most important turtle nesting beach in Turkey. 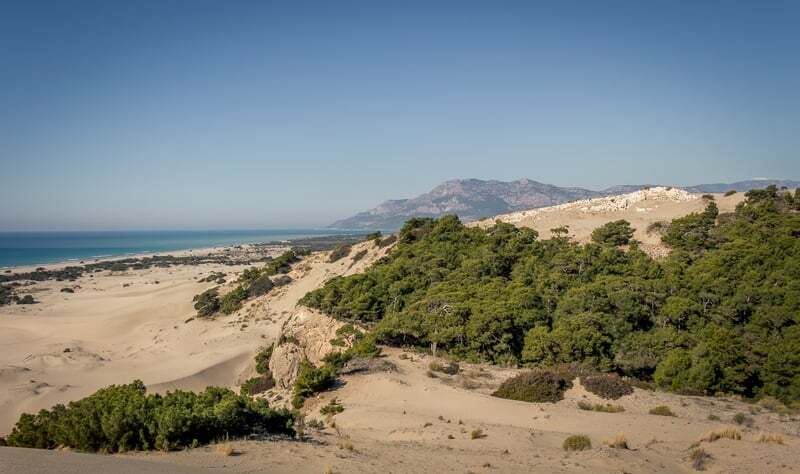 This beach and the surrounding areas are known as Patara. There’s more to Patara than just a perfect location to swim, sunbathe and camp (except during the turtle breeding season). It used to be a Lycian city which was a big commercial center and one of the most important seaports at the coast of the Turkish Riviera. And… it was the birth town of Santa Claus! 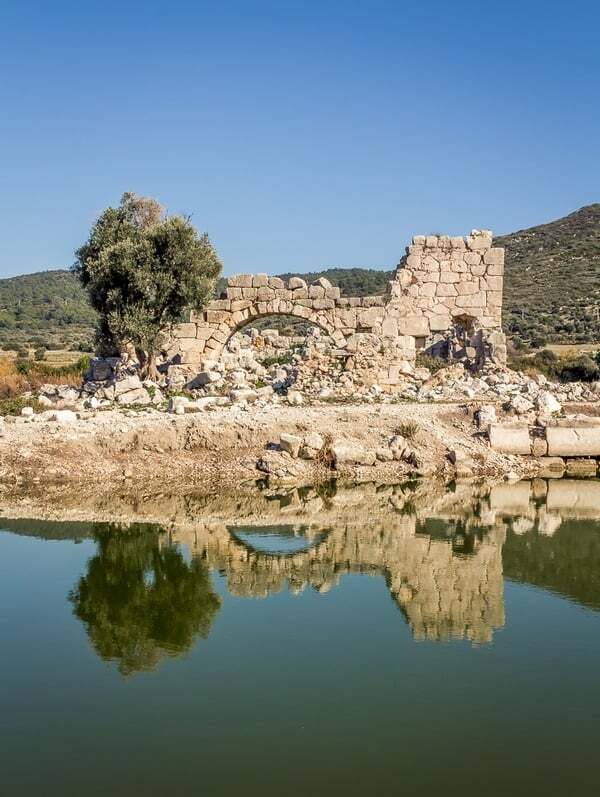 That’s right, Patara is the birthplace of Saint Nicholas also called Nikolaos of Myra, a 4th-century Christian saint who would later give rise to the traditional model of Santa Claus. You can still see the ancient ruins of this once flourishing city on the beach. Definitely worth a visit! Patara is also the stage for a unique cultural event that we would recommend to everyone to attend; the annual Nomadic Walk. 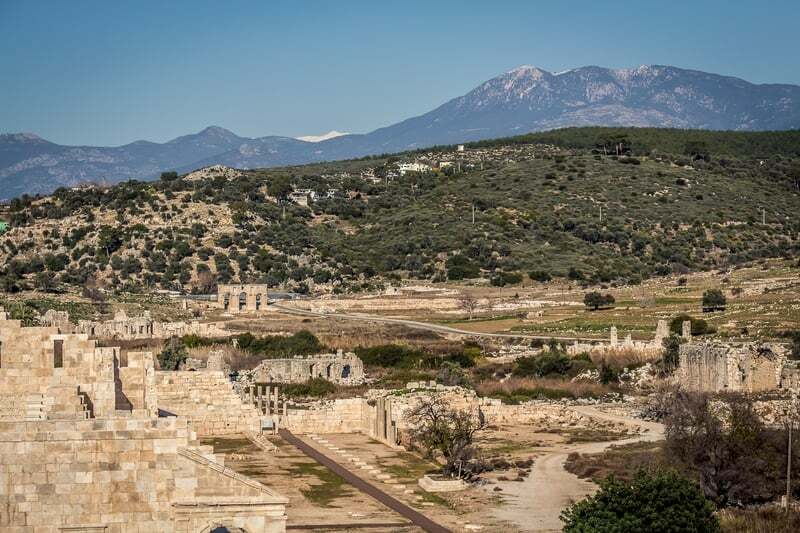 Every year, the people of Patara organize a 10 km walk from Delikemer to Patara where the hikers follow the old Roman aqueducts which were used to bring water from Islamlar, a small town in the mountains, to Patara. This walk also forms part of a 509 km footpath known as the Lycian Way. If you would like to know more about this event and maybe participate, have a look at our article In the Footsteps of the Nomadic Tribes. Want to go for a walk with this fun group? 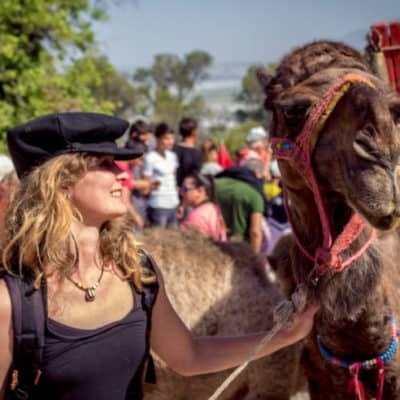 Definitely check out the yearly Nomadic Walk! Patara is 230 km South-West of Antalya, the easiest way to get there is to follow the coastal highway (highway D4000) through Kaş and Kalkan. 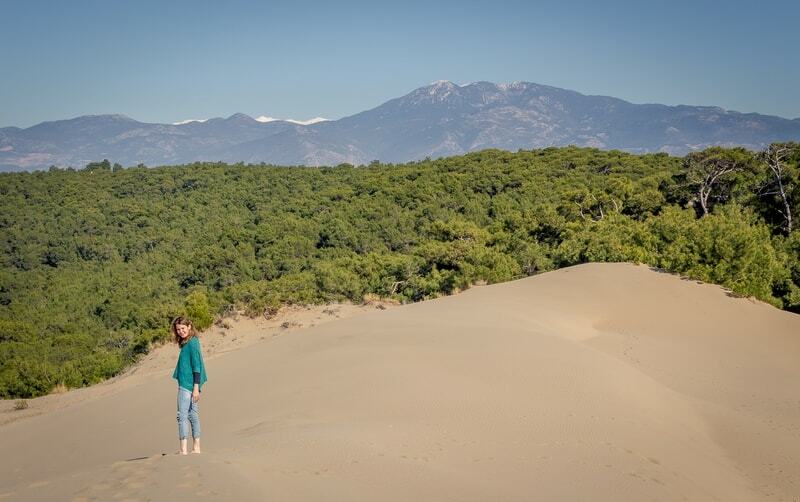 If you’re not in the mood to see the coast and rather see gorgeous mountain landscapes, there is an alternate route that follows highway 3500. If you’re coming from Fethiye, follow the highway D4000 south for 73 km. After mentioning the birthplace of Saint Nicholas on our list, the second place, oddly enough, happens to be the place where he died. 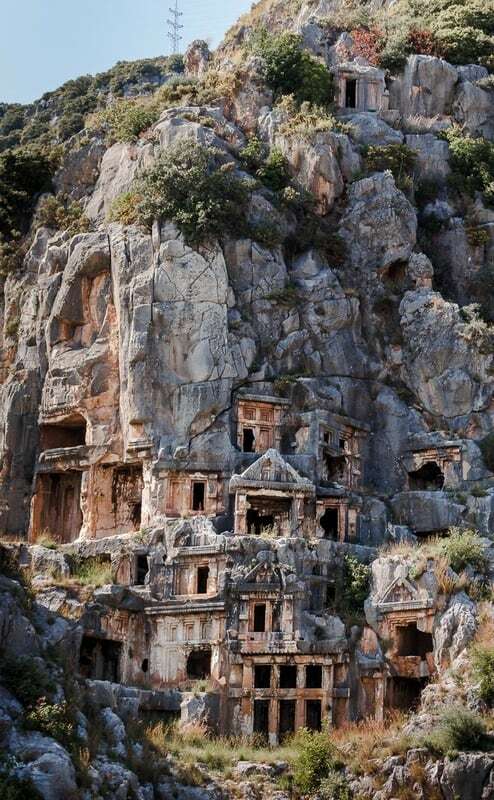 Myra was an ancient Lycian town, now called Demre. Most of this ancient city has disappeared. All that is left now are ruins of an enormous Roman theater, some ancient Roman baths and – what makes this place so interesting – two huge necropolises carved in the vertical rock cliffs: they are called the river necropolis and the ocean necropolis. Imagine a city of the dead carved into the soft rock of a hillside and you’ll get an idea of why this place felt so special and eerie at the same time. 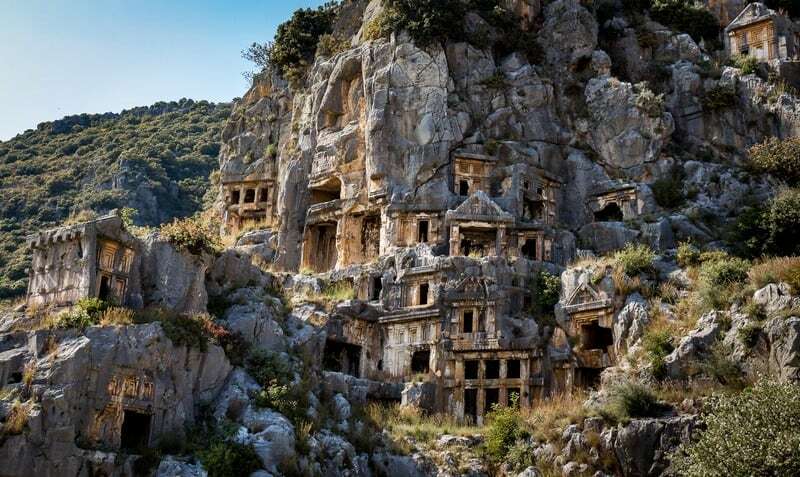 The Lycians believed that their dead were carried to the afterlife by magical winged creatures so they always built intricate rock tombs for their deceased in high places like the cliff sides. 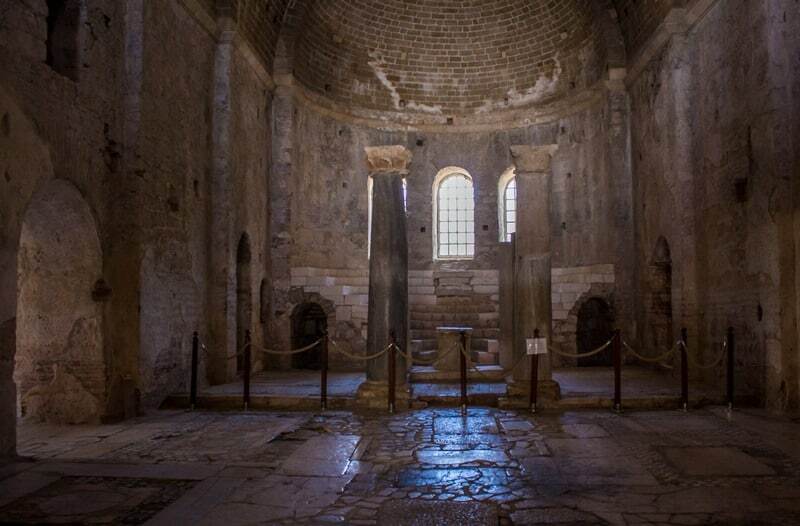 No trip to Demre would be complete without visiting the tomb of Saint Nicholas. Yes, Santa Claus was real and you can visit his grave in the church of Saint Nicholas in the center of Demre. 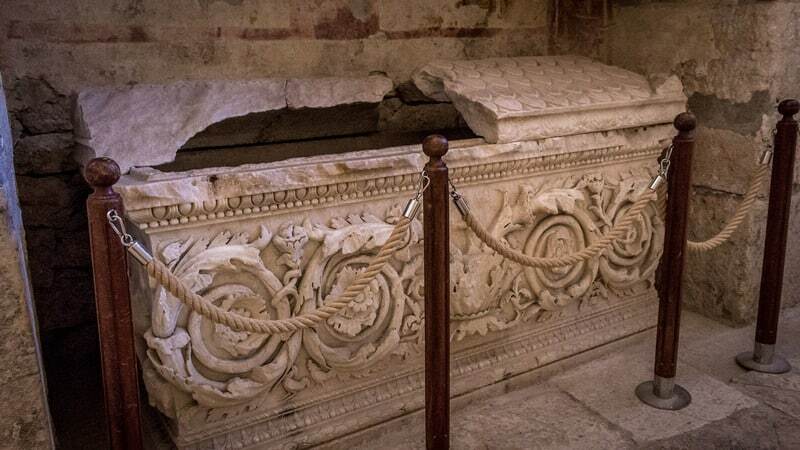 His remains, however, lie elsewhere since his bones were looted 700 years after his death by Italian sailors. Nonetheless, this church is an amazing place to visit. After a nearby river changed its course, the church got filled with silt and was buried but the remarkable wall fresco’s remained intact and is one of the reasons people from all over the world come to visit this place. If you like to see more of this area, check out our video Santa’s Tomb. Demre is located almost halfway between Patara and Antalya. 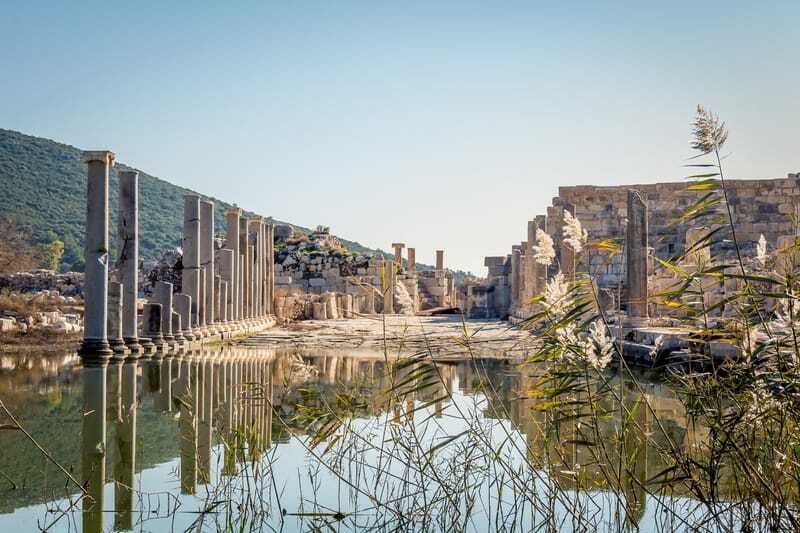 To visit this city just follow the coastal highway (D4000) east of Patara for 87 km. 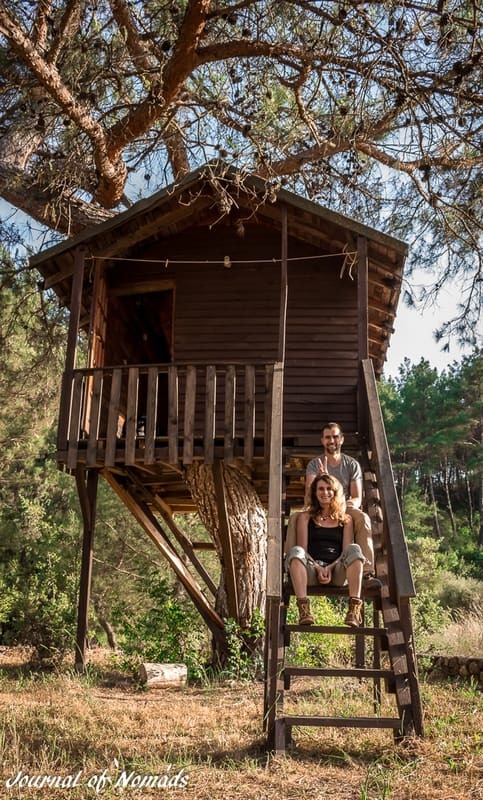 If you’re interested in spending a night in a tree house, hanging out with a cool hippie community in a gorgeous pine forest and exploring ancient ruins overgrown by the forest in Indiana Jones – style, then Olympos is the right place for you! It’s only 65 km from Demre and it’s an area where we both felt super peaceful and connected with nature. A part of Olympos is overgrown with hostels but we know a place that will take you away from the crowd and will feel like a quiet haven. 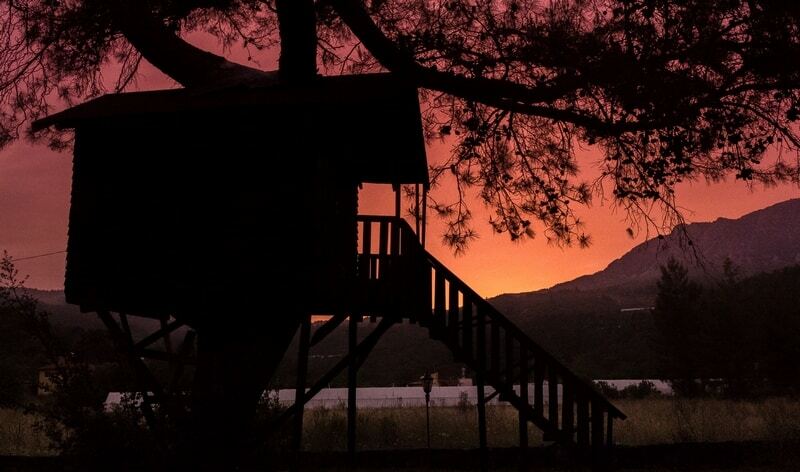 The best way to spend a few days in Olympos without breaking your piggy bank is by renting a tree house in Olympos Woods Treehouses. We were planning to stay there for only one night but we were so comfortable there that we ended up staying for three days. The owner was super friendly and genuinely interested in our journey. He made us feel at home and gave some awesome tips on what to do and which places to explore in the area. 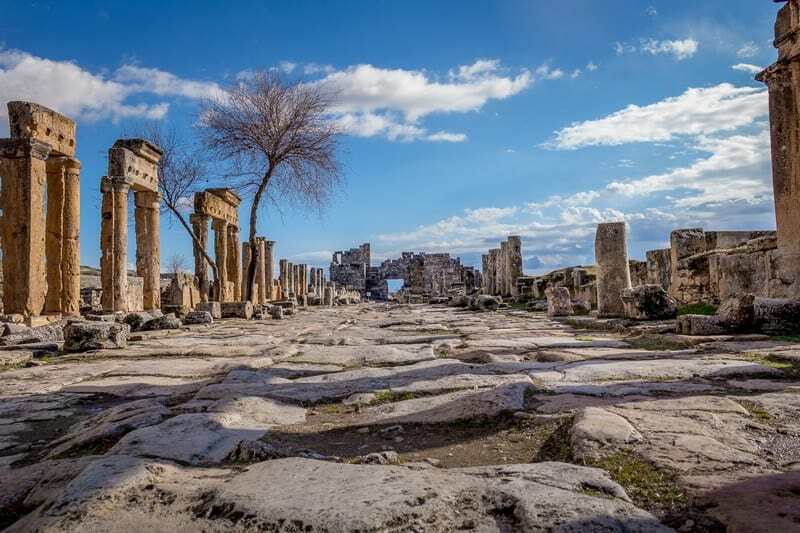 Most people come here to explore the ruins of the ancient city Olympos. What pleasantly surprised us was that the majority of these ruins is overgrown by the forest, which gives the place a strange supernatural atmosphere. If you want to visit the ruin complex, make sure you have a look at the official map beforehand. The area is quite big and we got lost a few times amidst the small paths. Any article on Olympos would be incomplete without mentioning Mount Chimaera. This place blew our minds. It’s about a one hour walk from Olympos to arrive at the entrance of Mount Chimaera. After paying a small entrance fee, it will take another hour to climb to the top of this small mountain. 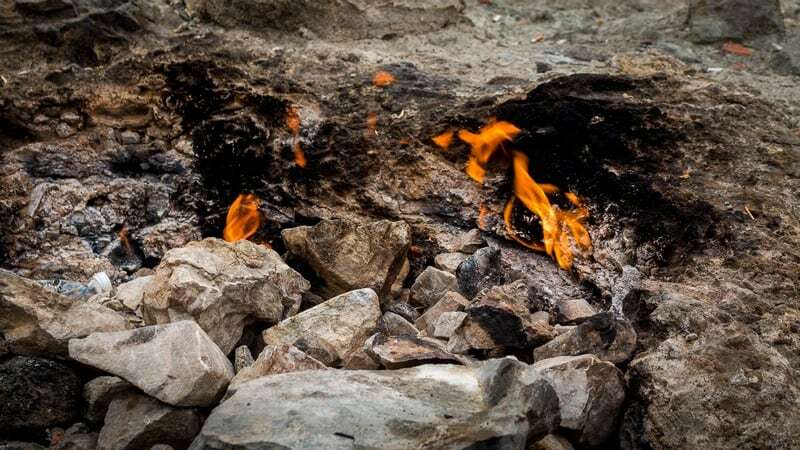 There you’ll find the most unusual sight: methane and all sorts of other gases emerging from the rock and burning day and night as they enter into contact with the air. If you want to take stunning pictures of this place, we recommend going there just before sunset. The eternal flames coming from the rocks will be at their nicest around that time of the day. You’ll definitely leave with an amazing picture. Just make sure you carry a torch to light your path on the way back. We cover this area in the video Sleeping in a tree house. 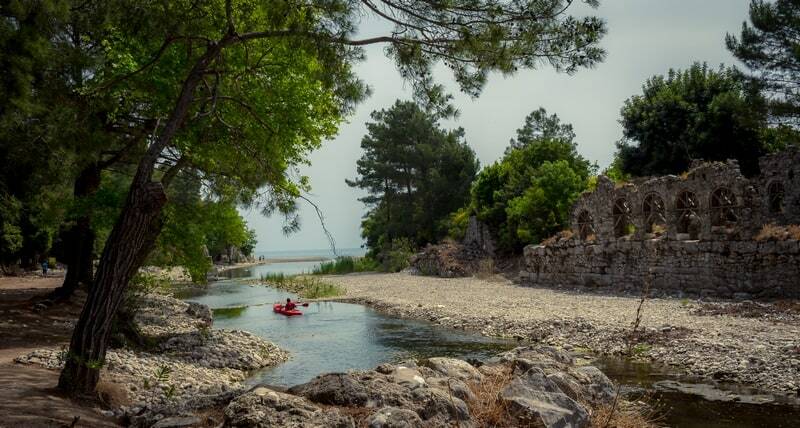 Olympos is located 77 km north of Demre following the coastal highway (D4000)/ As you will approach Olympos the highway will start going through a very high mountain pass, if you have time, stop and enjoy the view before continuing to the ruins, it’s worth it! The Lycian Way is a footpath that spans across 540 km of mountains, coastline, and valleys from Fethiye to Antalya. It also connects the previous places I’ve mentioned. If you love taking long hikes in nature and want to put your stamina to the test, then you will love this walk. 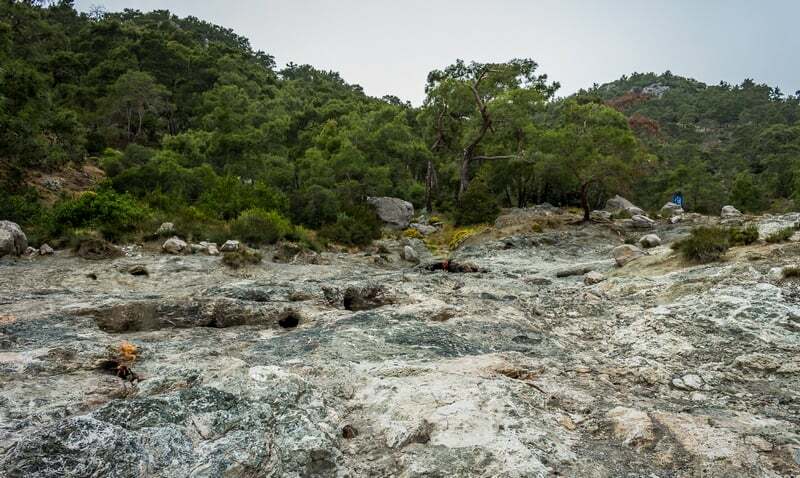 Hiking the whole path will take about 29 days and it connects major archaeological sites, beautiful coastline, gorgeous beaches and lush pine forest. A must do for sure! The trail is well marked with a red and white logo so no need to worry about getting lost along the way. It also goes through numerous villages and small towns where you can find accommodation and food. Camping is optional but we would definitely recommend it. Imagine pitching your tent next to an old Roman arch lost in the pine forest or on a beautiful beach next to a lagoon. 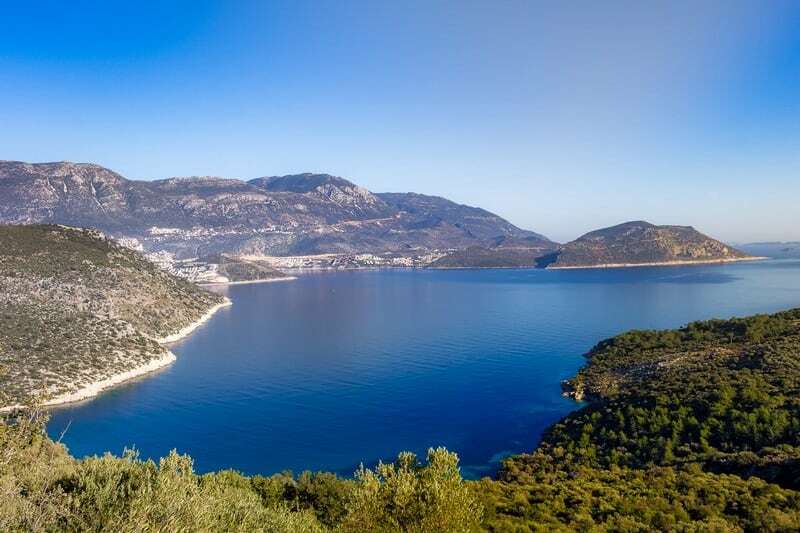 The Sunday Times has listed the Lycian way as one of the world top ten walks. 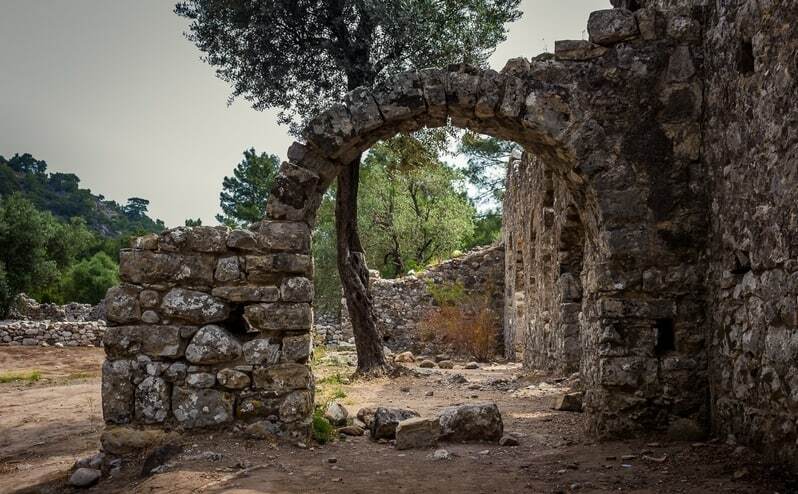 You can find more practical advice to walk this ancient route on Hike the Lycian Way. The Lycian way starts in Oluzdeniz 2 hours from Dalaman airport and finishes in Antalya but you can find numerous access points to this path along the coast. 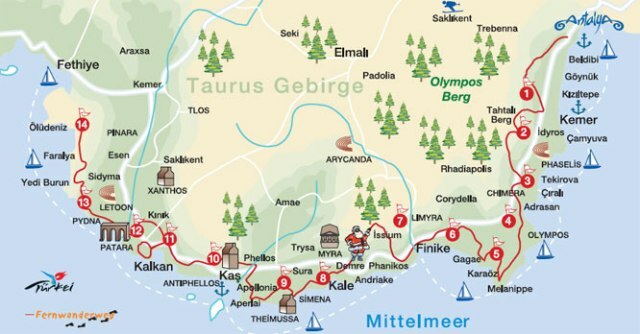 Since it connects the archaeological sites of Myra and Olympos, it is also very easy to access the path from these two locations. Pamukkale means “cotton castle” in Turkish and the name really suits this place well. 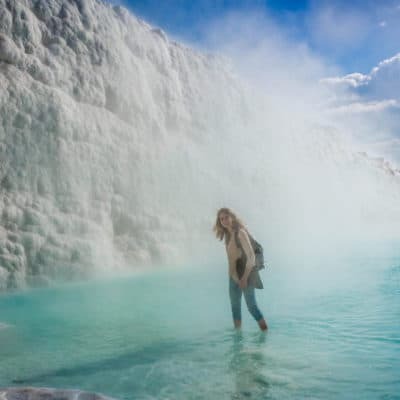 It’s the most unreal landscape I’ve seen in my whole life, made up of mineral white forests, petrified waterfalls and a series of terraced warm pools of water. Add to that the countless waterfalls connecting all these pools together and you’ll understand why we were speechless and baffled by this place. The terraces are made of travertine, a white sediment deposited by the water from the hot springs. It solidifies over time and become as hard as a rock. This sediment has created numerous platforms, cliffs, and terraces, giving the place the appearance of a giant white castle. The temperature of the water that emerges from the 17 water springs is usually between 35 °C (95° F) to 100 °C (212° F) and you’re allowed to bathe in almost all of them. It is said that even Cleopatra herself bathed in these pools. 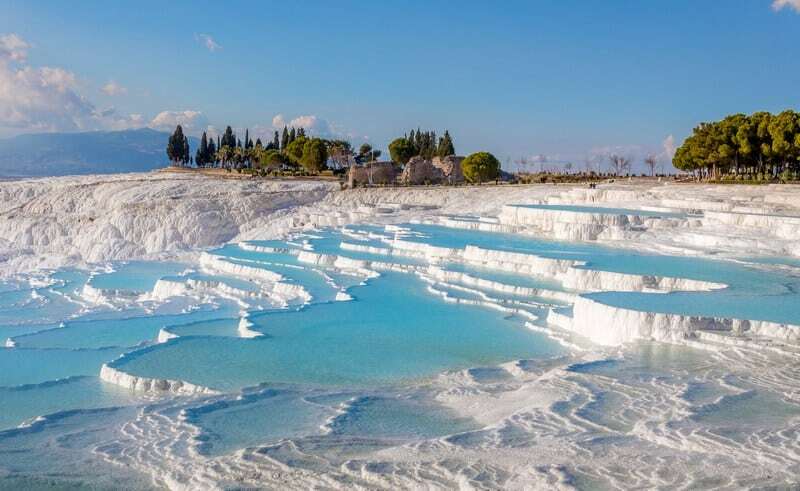 Pamukkale also covers the site of the ruins of the ancient Greek-Roman city called Hierapolis. 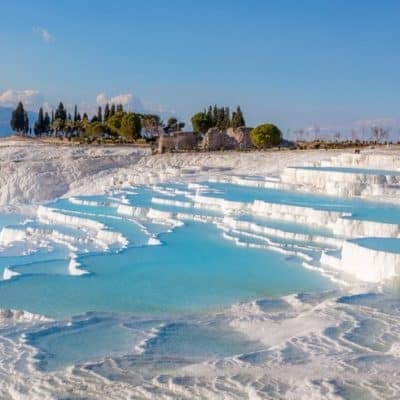 Read more about the white castle or the ancient city of Hierapolis in The miraculous pools of Pamukkale. Pamukkale is 209 km northeast of the port of Marmaris where we first arrived in Turkey. We hitchhiked from Marmaris to Denizli and from there it was only a short distance away ( another 16 km give or take) to hitchhike to the white castle. No trip to Turkey would be complete without a visit to this iconic city. 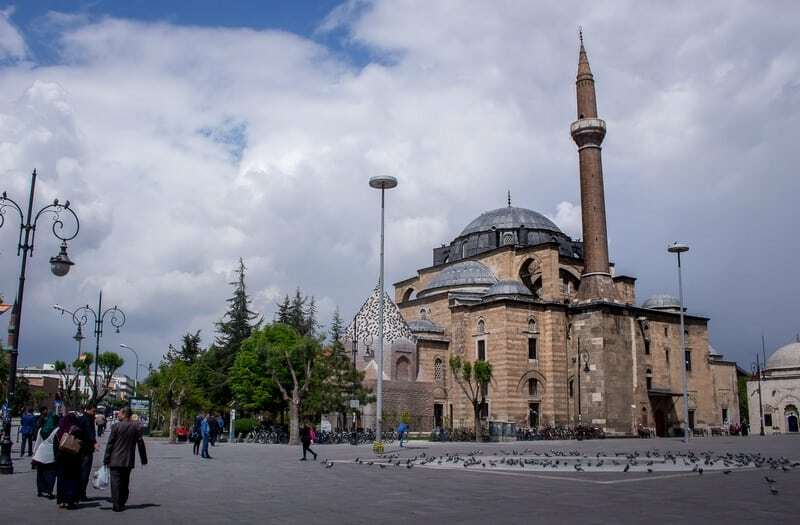 Konya is the Islamic capital of Turkey and the home of the famous spiritual poet Rumi. From incredible architecture, great food and the spinning Dervishes to some of the oldest mosques in Turkey, this is the city to get your dose of culture. 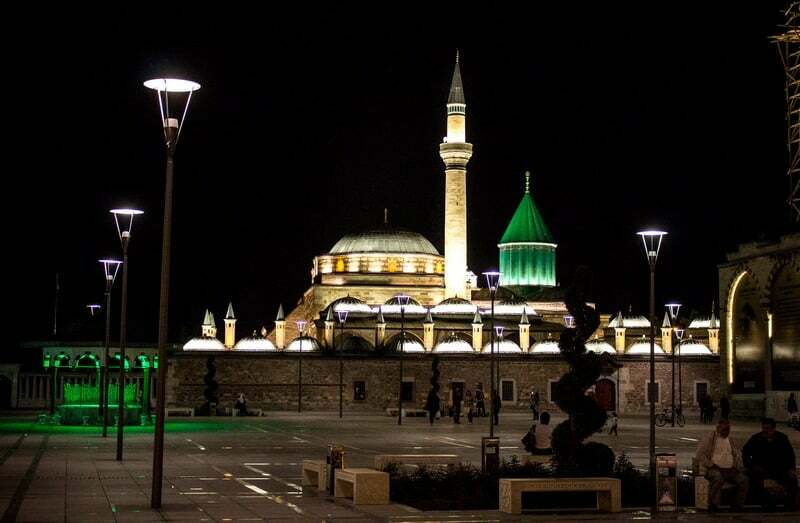 One of the main reason people visit this city, is to see the Mevlana museum. It shelters the tomb of Rumi, who was a mystic, a Sufi saint who loved all religions and whose own religion was love. Rumi is known to Turks as Mevlana (the Sainted One) and his followers would (and still do) lose themselves in a spinning dance and trance. They are called the Whirling Dervishes. 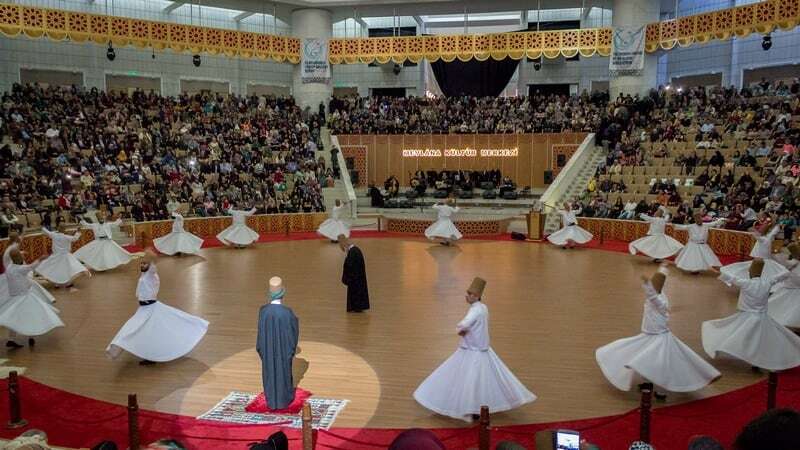 We were told that if we wanted to see an authentic Sema ceremony of the Whirling Dervishes, we should go to Konya, the heart and soul of Turkey and the Mevlevi order. The Sema is held every Saturday night at 7:00 pm at the Mevlana Cultural Center and it’s free! You better go early to have a good seat, although the arena is enormous. The show lasts about two hours. The program starts with an explanation of what to expect and gives the historical background of the performance. The whirling is a form of Sama, a physical active meditation. It’s also called ‘Sufi spinning’. 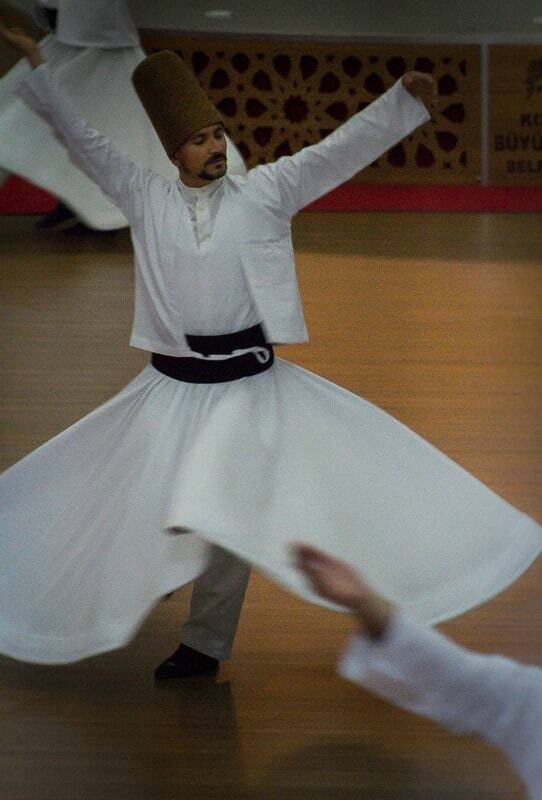 The Dervishes listen to the music, focus on God and spin their body in repetitive circles, which is a symbolic imitation of the planets orbiting the sun. This spinning dance represents a spiritual journey to enlightenment in which the Dervishes aim to reach the source of all ‘perfection’. They seek through abandoning their egos and personal desires to find truth and cultivate inner peace so in turn, they can foster out peace and world harmony. Watching them dance was very mesmerizing and hypnotic but we’ll have to be honest here. There were a lot of people attending the Sema who were only there to take a few photos. Some of them spoiled the experience by not showing any interest and babbling away with their neighbors. 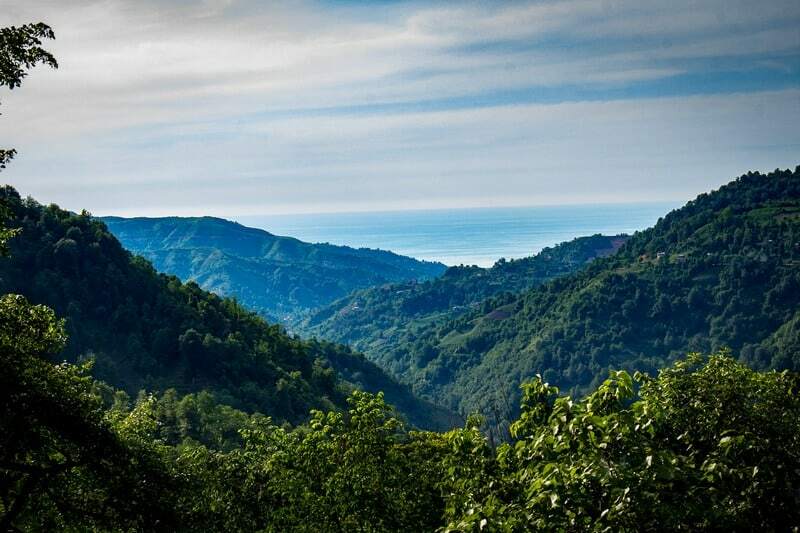 If you are coming from Antalya, follow the highway D4000 until you are in Kizilaga. From there take the D695 north and follow it until it becomes the highway D696. Continue following this road and you will arrive in Konya. The total distance from Antalya to Konya is 304 km. 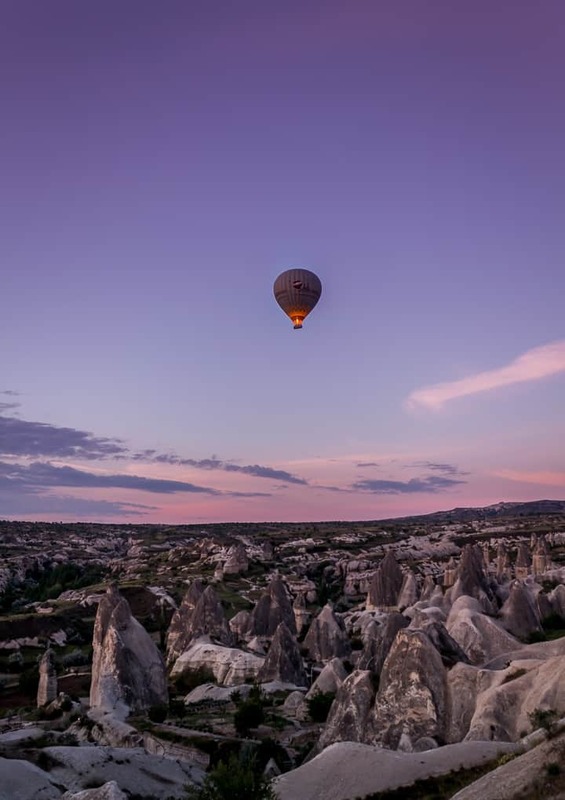 Cappadocia is a spectacular landscape in Central Turkey where hot air balloons rise with the sun and people live in caves and rock houses that they call home. 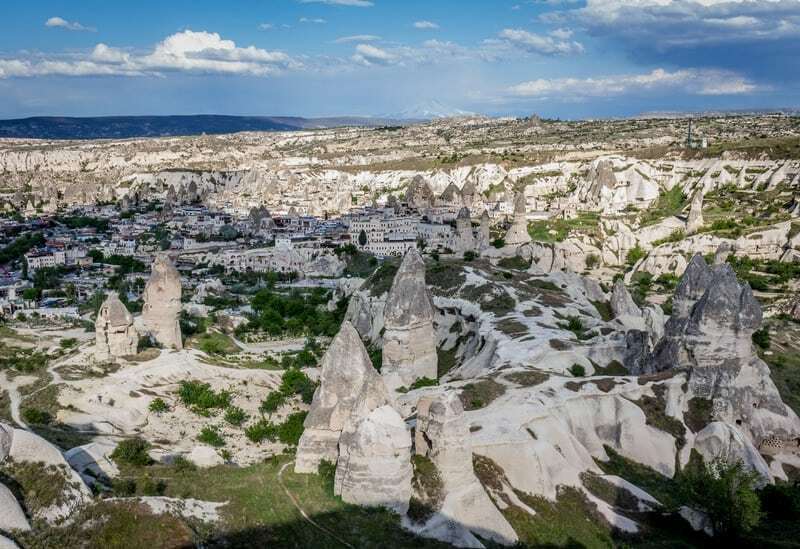 It sounds almost like a land out of a fairy tale and with it’s “fairy chimneys” (tall cone-shaped rock formations) Cappadocia has an out-worldly scenery. It is a land of vast plains, rolling hills, rugged mountains and extinct volcanoes. The formation of this strange landscape started when three volcanoes began erupting frequently. The deposits of volcanic ash, lava and basalt are the foundations for this landscape. 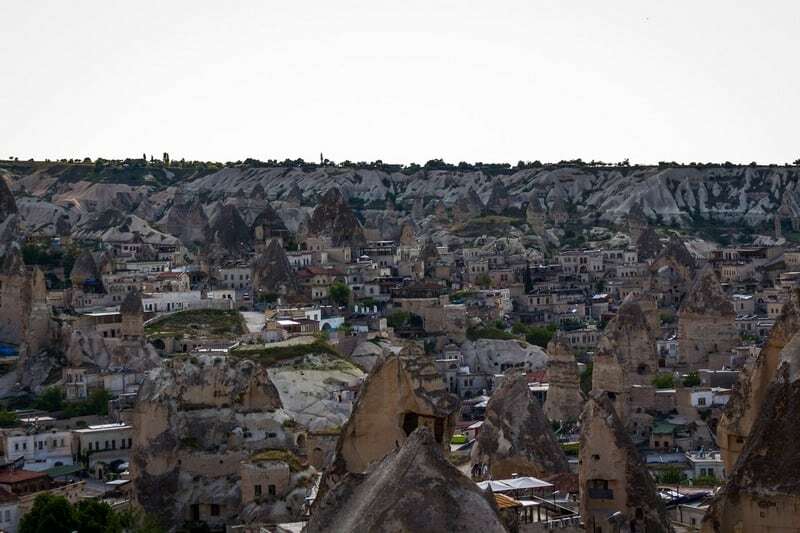 Earthquakes and ongoing effects of erosion have contributed to form the valleys and the “fairy chimneys”. Cynthia and I both agreed that the word “amazing” didn’t even bring this incredible landscape justice. Cappadocia has a history as remarkable as its landscape. The first dwellers of this region were troglodytes (cave dwellers) who carved their homes into the porous rocks of the area and sought shelter underground. They even created a few underground cities! Those cave houses were later used by early Christians fleeing Roman persecution. 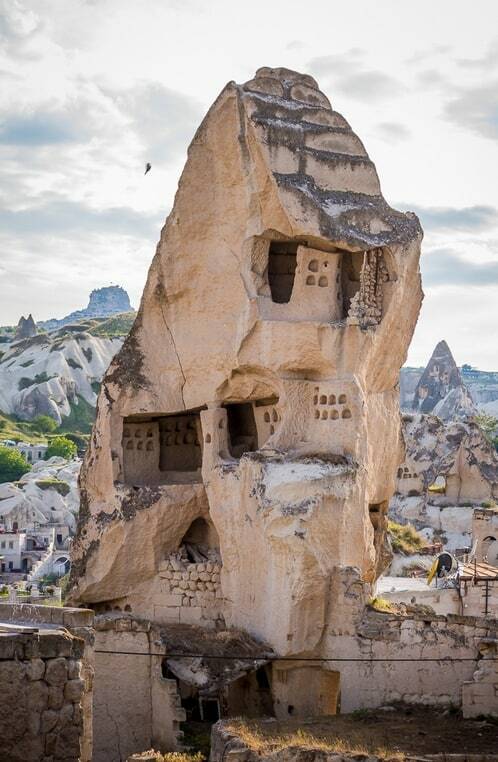 Nowadays Turks use the caves as their own homes and it’s even possible to sleep in Cappadocia in a cave hotel. 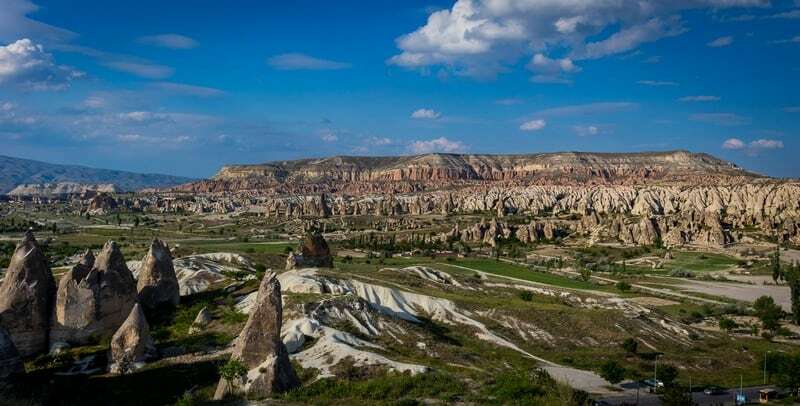 There are plenty of fun things to do in Cappadocia but whether you come here for the great hikes or for the experience of sleeping in a cave hotel, it’s the landscape that you will never forget. A great way to see the beautiful valleys and mountains in this area is by taking a hot air balloon. They take off at sunrise and fly for one hour at a time over the fairy chimneys, orchards, and vineyards. This place has been voted one as the best destinations in the world for hot air ballooning and attracts people from all over the world so make sure to reserve your ticket a bit ahead of time during high season. The cheapest tickets for a standard flight are sold for about €90. 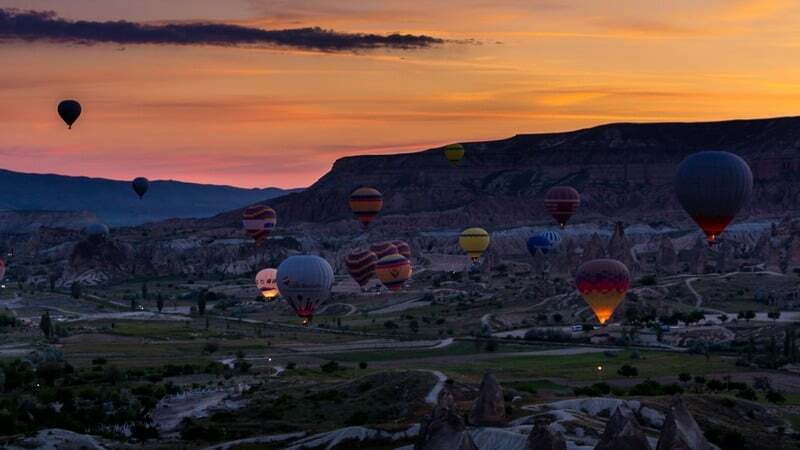 Watch more about Konya and Cappadocia in the video Dancing Dervishes and Hot Air Balloons. Take the highway D300 northeast of Konya and follow it for 236 km towards Nevsehir. When people come to Turkey, they usually think of Istanbul and the gorgeous turquoise beaches in Antalya. 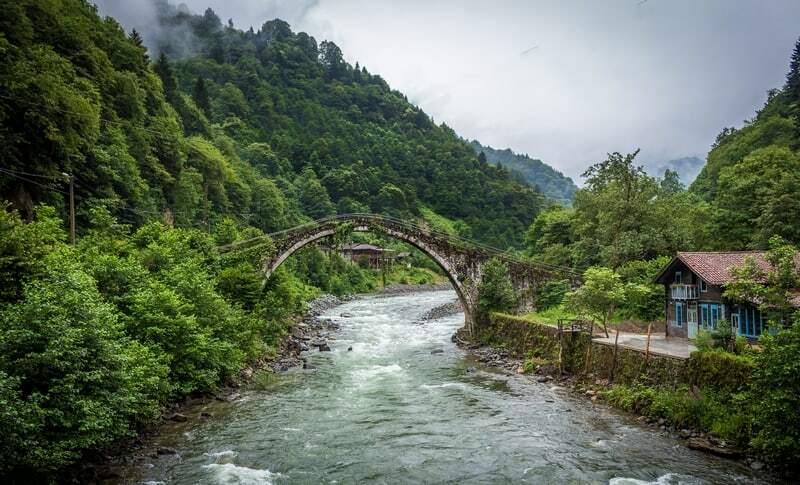 They imagine Turkey as a very arid place and often don’t consider visiting the most eastern parts of this country, unbeknownst to them the north-eastern provinces of Rize and Artvin are probably some of the most beautiful and lush in Turkey. There, the landscape is riddled with tea plantation, green forest, huge rivers and hidden waterfalls. It’s a perfect place for nature lovers. If you’re a fan of hiking in the mountains, white water rafting or swimming in fresh rivers coming from the mountains, you will love it there. It reminded us of a few places we had visited in Malaysia and Mexico. Certain villages even looked like they came straight from thTheovie “the Sound of Music” especially the village of Ayder, a small summer resort where you can bathe in hot springs. If you would be interested in learning more about this fascinating group of people, make sure you visit the gorgeous Bageni Pansyon near Findikli in the Black Sea Region. Evrim, the owner, is our age and a descendant of the Laz people of Turkey, We spent the day gazing at the green valley below the hostel and the sea in the distance while the father of Evrim was reciting beautiful Laz poems and explaining more about the history and culture of the Laz people. We even learned a few Laz words! The amazing view from the hostel! The fastest and easiest way to get there from Istanbul is to follow the highways E80 and E70 east. The road is long (1219 km) but you will see some of the most scenic landscapes that we have seen in Turkey. 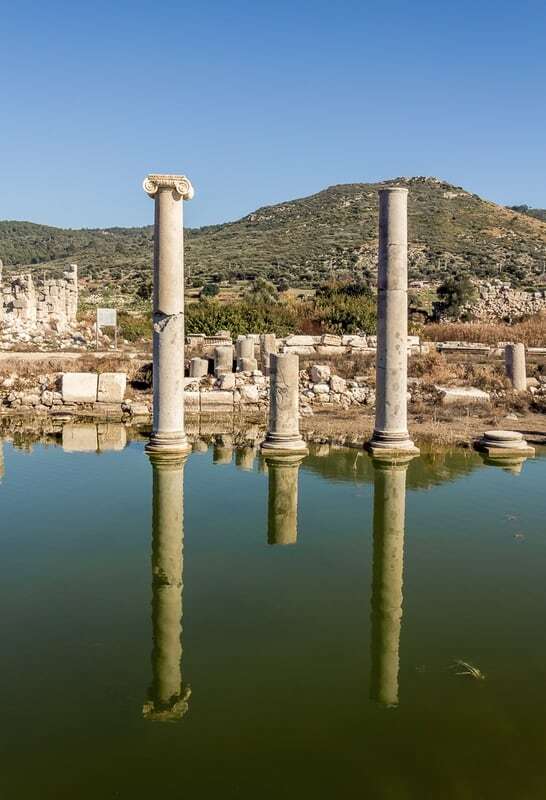 We hope this article inspired you to travel in Turkey. 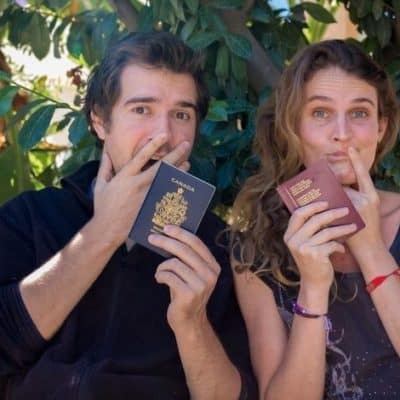 If you’re ever in this country and wonder if you should hitchhike or not, give it a shot. 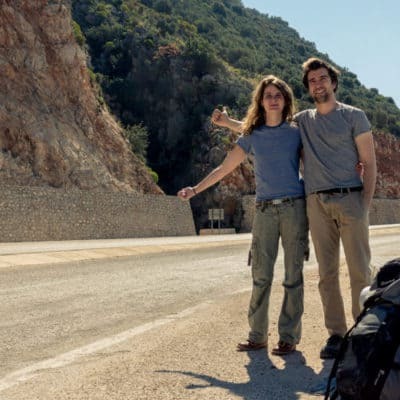 Hitchhiking and traveling here is totally safe and fun as you can read in One year of hitchhiking part 2: Turkey. Don’t forget to check out our Backpacker’s Guide to Turkey, in which we tell you everything you need to know about this beautiful destination! 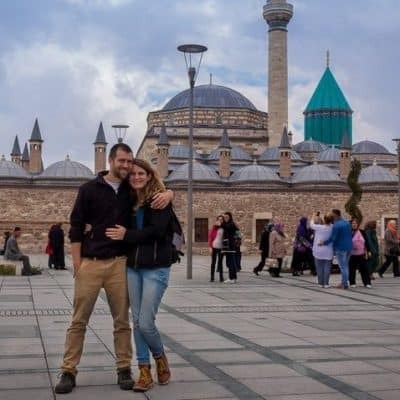 Backpacking in Turkey on a budget – How much does it cost to travel in Turkey? thanks for the advice. what is effes? Turkey has been on my radar after seeing so many beautiful pictures on Instagram. I would love to go on a hot air balloon in Cappadoci one day! 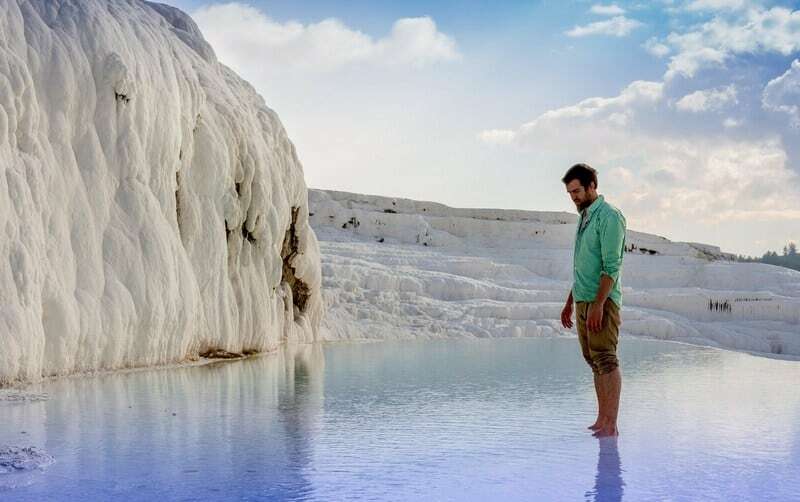 And Pamukkale looks absolutely stunning! You’ve discovered so many beautiful gems!! What’s your favorite??? I’m bookmarking this for when I take a trip to Turkey! I’d love to go to Pamukkale and Cappadocia most especially! And maybe ride on a hot air balloon! What a dream! Myra is definitely worth a visit! Where did you stay when you visited Turkey? 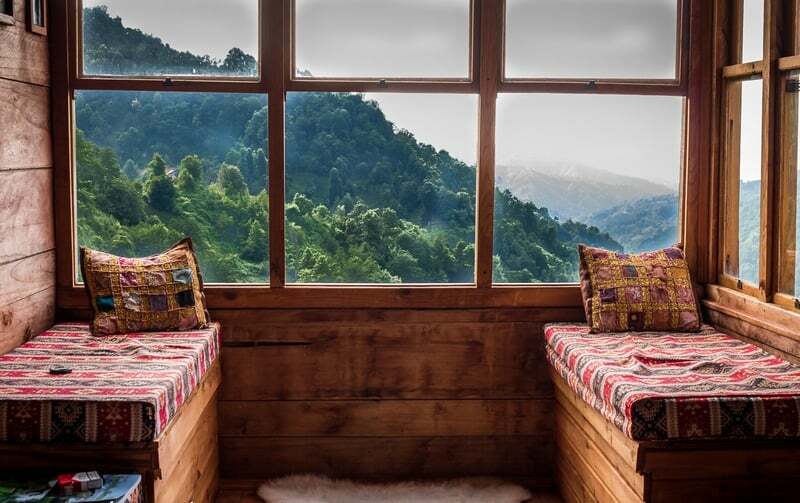 Turkey is a wonderland and all of these places that you have listed look breathtaking. Turkey has been in my bucket list since a long time and now I can’t wait to add these places in my bucket list. Amazing! Pack your bags and go there NOW 🙂 We were very pleasant surprised when we discovered all these beautiful places that Turkey has to offer!! All of these places look simply incredible, most of which I’d never heard of before! Patara and Myra remind me a lot of different archaeological sites in Jordan. I suppose given their geographical proximity they must share a little bit of history right? Also, I’ve never actually seen a photo of Cappadocia without balloons in it so haven’t ever fully appreciated the landscape. It definitely looks absolutely breathtaking! 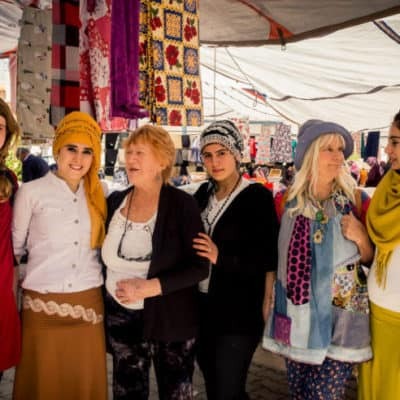 Great post Nicholas, You posted covered almost all the must see sites Turkey. Love it. 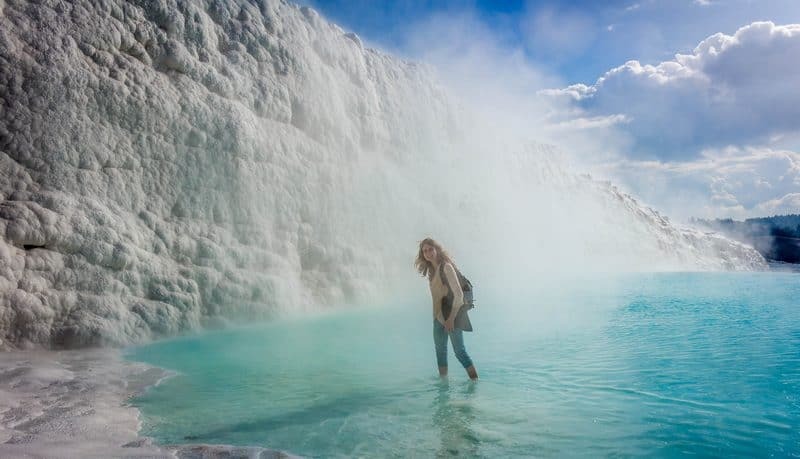 I must say that I had thought of visiting Turkey one day but the pictures from Myra, Pamukkale and Cappadocia are simply stunning. More interesting than the capital Istanbul, which everyone talks about. We first had the idea to visit Istanbul but eventually never made it there. Instead we ventured through other parts of the country and we’re happy we did or we might have missed out on these beauties!